Y’all, something major happened on Sunday night: I hit the midpoint of Middlemarch. If you’ve been paying attention to the epic saga of my reading of Middlemarch, you realize what a big deal this is. You’re also, probably, really bored of hearing about it, I know. But I’m almost there, folks. Bear with me. I’m determined to finish it before the end of July! 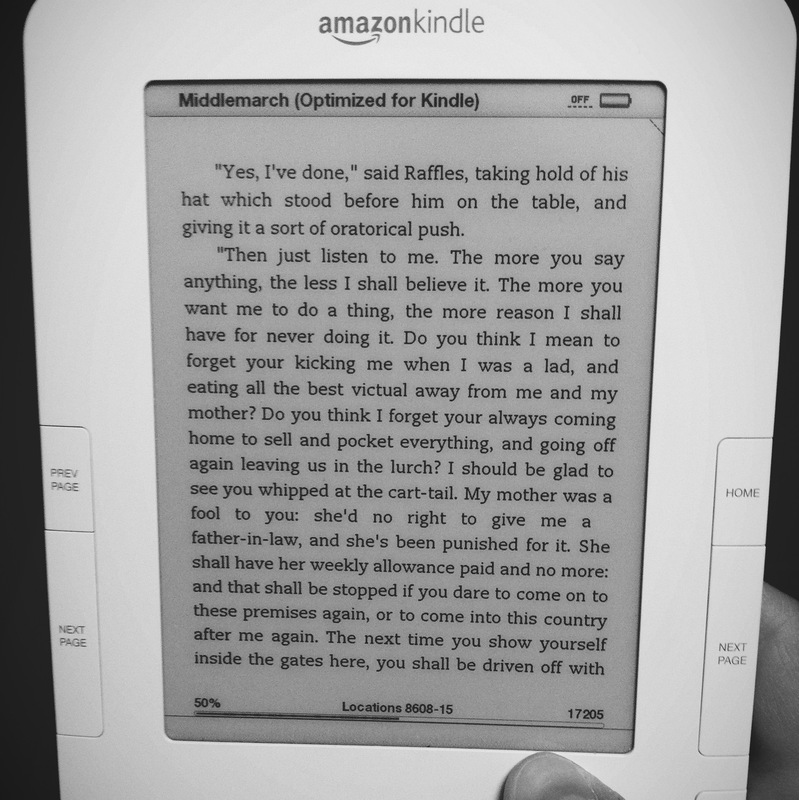 It’s fitting that the midpoint, according to my Kindle, anyway, happened on a page that involves a conversation between a character who had been first introduced maybe fifty pages previously, and a brand-new character introduced in that very chapter, because that, my friends, that pretty much sums up Middlemarch. So many words! So many tangents! So many subplots and minor characters which will receive a whole chapter’s treatment! And so many people making such terrible choices! But this is it, y’all. Let’s finish this thing. This entry was posted in Books, Reviews, and Reading and tagged 2013 reading resolutions, books, Middlemarch on June 18, 2013 by ms.grammarian.